Guruatma K. Khalsa was born in 1952 and grew up in a large, middle-class family in Chicago, Illinois. Being the oldest girl of nine children, she was always taking care of others, working both in and outside the home and struggling, just like her father, with severe allergies. In her freshman year in college, after months of battling with what doctors misdiagnosed as a sinus infection, she experienced the first flare-up of a rare, degenerative autoimmune disease characterized by acute inflammation and deterioration of the cartilaginous tissue throughout the body. One morning, she woke to a shocking sight in the mirror – the bridge of her nose was gone! An underlying disease process had slowly disintegrated the cartilage. For the next 24 years, a myriad of doctors were not able to recognize and identify that hidden disease as it went in and out of remission and attacked different parts of her body. Guruatma left college but continued working and eventually she had two reconstructive surgeries on her nose. In 1978 during a severe relapse, she desperately sought help at a 3HO-Kundalini Yoga Center. Here at last she found relief! Discovering something that gave such immediate and positive results, she threw herself, body, mind and soul, into that lifestyle while also learning about and trying alternative medicines. Her efforts paid off and the disease went into remission for about 17 years. But life is full of twists and turns and in 1986 she was hit by lightning and experienced the first of several encounters with death. The disease returned with a vengeance in yet another tragic episode, inflaming the cartilage in her rib cage during a period when she physically over-exerted herself doing deep-tissue massage. Doctors at M.D. Anderson suspected she might have cancer; they put her on morphine while they investigated for three months but found nothing. Once again, using alternative medicine, Guruatma weaned herself off the morphine and pushed the disease into remission. Years later, during a time of great personal stress, the disease surfaced again, exploding like a bomb and attacking several places within her body and including serious eye complications. 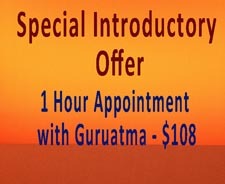 In February of 1995, Guruatma fell into the county hospital system. It was there that the disease was finally identified as Relapsing Polychondritis; she was given a 5-year prognosis and told to get her affairs in order. Doctors started her on chemotherapy, high-dosage prednisone, pain medications, and a host of other prescription drugs with devastating side effects. Guruatma lost her hearing in both ears during the course of chemotherapy. As if being profoundly deaf weren’t challenging enough, for three whole years the Audiology Department determined she was not eligible for hearing aids! Ever so slowly, using both alternative and mainstream medicine, and with countless set-backs along the way, she was able to incrementally wean herself off all prescription medication, including the 5 drugs she was told she would be on for the rest of her life. She fought a long, hard battle and the disease began to loosen its death-grip on her. By 2006, she was back on track doing yoga in a chair with modifications. Guruatma’s Chair Yoga class was born of this era. Using the yogic tools that she now shares with others, she gradually lost 100 lbs. and learned how to take care of her Self in order to live a healthy and happy life. In 2008, Guruatma began teaching a daily 6 a.m. Kundalini Yoga class at Yoga Central in Houston, Texas where she lives with her husband. In March, she began her public speaking career, accepting an invitation to participate in a TV panel discussion on Hearing Loss. As her world opened up, she was asked to teach and she created a ‘Chair Yoga Class for Seniors and for People with a Disability’ at the City of Houston MMSC Adaptive Sports and Recreation Center where she had been assisted throughout her own recuperative process from 1999 – 2007. That class is well attended and now in its 8th year! In 2009, Guruatma started working with individual clients challenged by chronic and critical illness, while organizing her expertise and information into easily accessible materials, and in 2011, she officially opened her business ‘Yogic Tools’ and its accompanying website. Visited by hundreds of people around the world on a daily basis, yogic-tools.com offers helpful, inspiring information and practical tools. 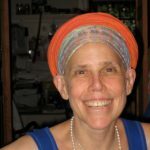 In 2010, Guruatma started gathering and organizing the fruits of her journey into an easy-to-use blueprint for dealing with chronic and critical illness. 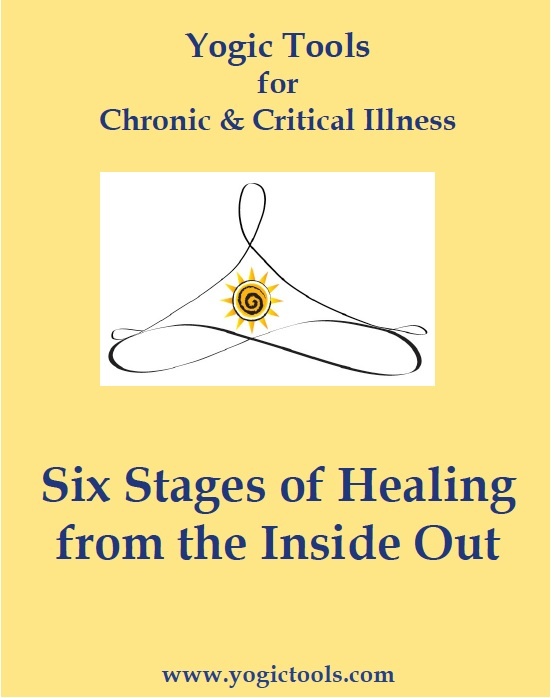 The Six Stages of Healing from the Inside Out Program distills her knowledge and experience to address some of the challenges and changes people with chronic and critical illness have to face along the path of their healing journey. Each Stage embodies a guiding wisdom and positive affirmation to help face a particular aspect of the journey through chronic and critical illness. Not everyone will experience all of these Stages, nor walk them in a particular order, but each one offers hard-won pearls of wisdom from Guruatma’s own personal story. Guruatma has walked through the long, dark night of the soul. Although she had support coming in from many directions, she knows how it feels to suffer though the intense loneliness that can accompany a chronic or critical illness. She has lived through years of inexplicable pain and suffering, dozens of misdiagnoses, prescription drug nightmares, fighting tooth-and-nail to keep from falling through cracks in the medical system and, dealing with feelings of abandonment, hopelessness and wanting to die. For all those challenged by chronic and critical illness,Guruatma stands out as a victor and a light in the darkness, showing the way to make it through, giving step-by-step instructions, support and encouragement. My name is Igor. I am a 23 years old male from Italy. Currently i’m a student struggling to finish my last year in a B.Sc. in Biotechnology. I found your website on the internet. At the age of 18 i was diagnosed with Hashimoto’s disease and since then i was never the same. At first it started with chronic sleepiness and tiredness and i got a bit overweight, but then after 2 years it got worse affecting my mind. In particular i have severe anxiety , severe difficulty to focus, low memory, always worrying, obsessive compulsive behavior, very irritable. In general i feel like i’m loosing my mind at times. I am on thyroxine hormone, but it seems to just affect my blood work results, but it doesn’t cure my symptoms at all. I actually am afraid to make them worse. I would like to kindly ask for a way to get over with this nightmare and take my life back. Since i got this disease i’m stuck.